Dubai, UAE, July 09, 2018: Sun, sand and sea are the three staples of the ultimate summer! And that usually means saying hello to shorts, long hours in the sun and a golden glow. The downside? The hot summer sun causes premature ageing, pigmentation and dehydration among other more serious skin concerns. For that very reason, there are a few must haves that everyone should have in the summer when exposed to the sun in order to protect skin from premature ageing such as an antioxidant and an SPF to protect against UVA/UVB rays. It is vital to be consistent with these steps to prevent and protect your delicate skin from sun damage. After all, the skin is the largest organ in the human body and it is important that it remains healthy. Most people are constantly on the lookout for extras to add to their skincare routine and while there are so many skin products available on the market for almost every skin concern, there is a limit to how many products can be applied topically because less is more when it comes to skincare. To reveal your best summer look yet, consider Skinade, the multi-award-winning collagen beauty drink that works from the inside out - a sure way to fabulous, healthy skin! This beauty beverage is packed with powerful ingredients and its unique liquid formulation that’s designed to boost the skin’s natural production of collagen, hyaluronic acid and elastin for smoother, younger and more hydrated skin. With no artificial colouring and naturally flavoured with refreshing peach and mangosteen, skinade should be your go-to summer drink; it’s the perfect partner to your daily summer skincare routine. Skinade works to rehydrate as well as improve tone and texture for overall improvements to skin suppleness which is so necessary in arid heat. It is also important to be taking Skinade in humid conditions as well, where skin can become oily. The environment, combined with topical application of sun creams, after sun care and general skincare routine can lead to pores becoming blocked, which may in turn, lead to breakouts. Skinade contributes towards balancing out your skin, helping to prevent the build-up of excess oil. Other hero ingredients in skinade include Vitamin C and B vitamins to boost regular skin function, MSM for hair and nails, Omegas 3 and 6 for nutrients and L-lysine to combat lines and wrinkles. 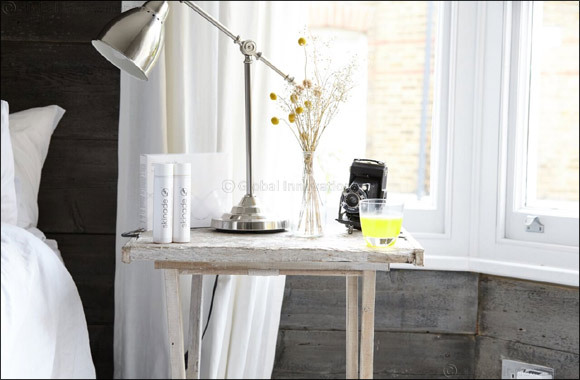 Skinade is sold in courses of 150ml ‘ready-to-drink’ bottles or 15ml travel sachets that you simply dilute in water. It is recommended to take skinade daily and it is sold in courses: 30 days, 60 days and 90 days. Skinade prices start from AED 800 for a 30-day supply and are available from Iwona Specialty Clinic, Sansaya Cosmetic Surgery and Dental Clinic, Euromed Medical Center, Rose Arbaji, So Spa – Sofitel, The Palm and Kalm Holistic Beauty.